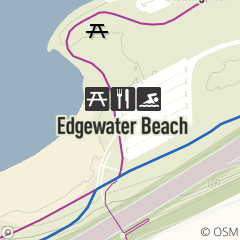 The 147 acre Edgewater Park is the westernmost park in Cleveland Metroparks Lakefront Reservation. Edgewater Park features 9000 feet of shoreline, dog and swim beaches, boat ramps, fishing pier, picnic areas and grills and a rentable pavilion. Consists of 240 acres that includes Edgewater Beach, Perkins Beach, the Marina and Yacht Club. The new and improved roundabout entrance and Cleveland Lakefront Bikeway allow as east access to the area.